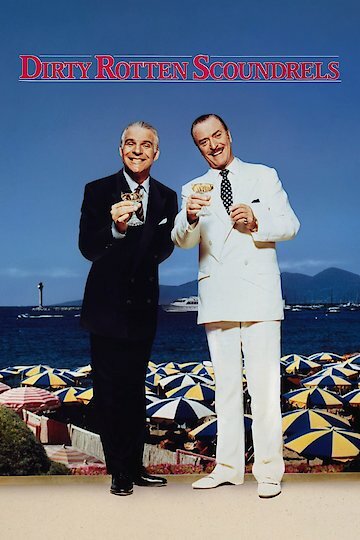 “Dirty Rotten Scoundrels” is a dark comedy that stars Steve Martin and Michael Caine. It is the story of two devious con men that prey on rich ladies in the French Rivera. Lawrence Jamieson, tries to infiltrate and seduce wealthy women to gain their trust. After they are comfortable; he swindles them out of their money. Business is good for Jamieson. He hears whispers of a rival con artist nicknamed “The Jackal”. A new foe, American Freddy Benson, appears on the scene. Lawrence is suspicious that Freddy may be the jackal. Those fears are quickly dismissed when he sees how amateur and clumsy Freddy is. He quickly plots to eliminate Freddy from the area. His attempts backfire and he ends up decided to team up with Freddy to run cons instead. He has Freddy make a hilarious appearance in one of his cons where he pretends to be Jamieson’s mentally challenged relative. The two former enemies find it difficult to work with each other. They establish a wager where the loser will be forced to leave the area. They both target a victim and the first one to con $50,000 from her is the winner. The select the innocent and doe eyed American, Janet Colgate. Both con artists make sub-par efforts and both have plots foiled by the other. Jamieson poses as a psychologist and offers to take Janet on as a patient. In their conversations he comes to find that she is not wealthy at all, she was just a contest winner. He attempts to call off the bet since she doesn’t have the $50,000. Freddy offers to make her heart the prize. Angry patients and members of the Royal Navy also stand in the way for various reasons. Jamieson thinks he will do the right thing by sending Janet home to America and sneaks her on a plane. Janet shows back up the next day. We end up wondering who the true con artist is. We find out in a surprise ending. Dirty Rotten Scoundrels is currently available to watch free on Tubi TV, The Roku Channel, Pluto TV, Vudu Free and stream, download, buy on demand at Amazon Prime, Amazon, Vudu, FandangoNow, iTunes online.